Parathas are always a big yes to my kids. And it becomes easy in a way to sneak in veggies too. If you are looking for a simple lunchbox idea,this can be a helpful one as well. Raw papaya is an excellent source of fiber and so beats constipation and promotes digestive health. Raw papaya has the greatest amount of carotenoids than tomatoes and carrots. Hence it helps prevent vitamin deficiencies which kids are frequently prone to have. It is also helpful to ease menstrual pains for women. Though I do prepare papaya thoran but at times this is a healthy alternative and kids love this over thoran. The taste of these parathas is similar to mooli parathas and has no obvious flavors of its own. Do try it out if you are looking to add this veggie in your menu. Wash and peel the skin of raw papaya. Remove the seeds. 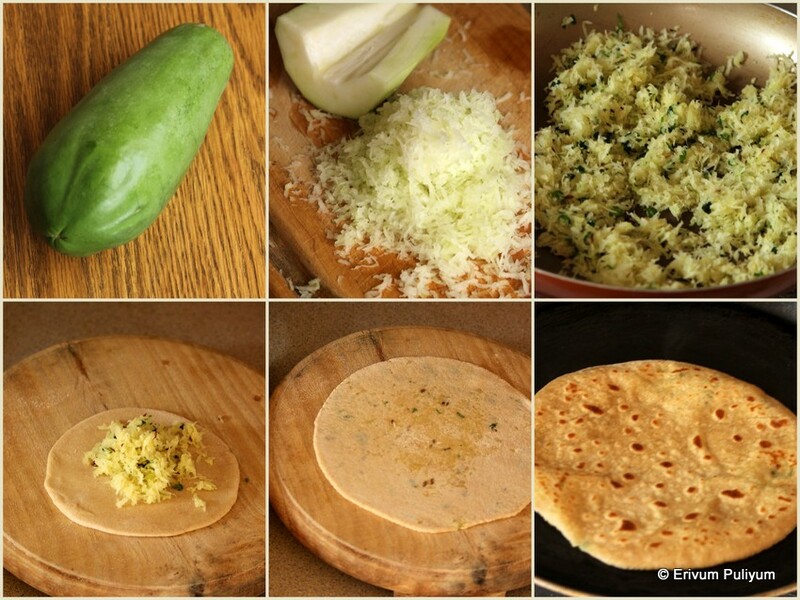 Grate the papaya with a grater like we do for mooli(radish) paratha. Heat a pan and add oil listed from the filling section. When the oil is hot, add cumin seeds, let it sizzle. Then add the grated papaya,ginger,green chilli,coriander leaves chopped and saute for 3-4 mins. Add salt to taste. The filling becomes dry and not sticks to the pan. Remove on a plate and let it cool. In the meantime, mix the wheat flour with salt.Add water as needed and knead to form a dough as needed. Cover and leave the dough for 20 mins. After 20 mins, divide the dough into 6-7 equal portion and make balls. Take out one ball and roll out the dough by dipping it in dry flour. Make a 3 inch round and then place a tablespoon of filling. Cover neatly to seal all sides, and then dip in flour and roll out again to make a 6" round circle. Heat a tawa and when its hot,slide the paratha on it. Flip and turn both sides on low flame( that makes the parathas more crispier ). Smear oil or ghee on both sides and transfer to a plate. Similarly, repeat the same step to make rest of the balls. Serve warm parathas with achar(pickle) or raitha. We had with a simple raitha and kadumanga achar( raw mango pickle). * You can also prepare this paratha by kneading the dough with the filling like I prepared these mooli parathas. That way it becomes easier to roll out. * This recipe is inspired from Nishamadulikka.com and I have tweaked slightly here and there. Wow this is a wonderful idea. Dear Julie. I've told you that I was going to give it a try, but now, after reading the list of ingredients, I can't buy raw papaya here. Let me know if it's the same to use mature papaya. Kisses. @Marisa G Thermofan no dear,its not the same with mature papaya..It will be nice if u can try with raw papaya,in case you find it.